The fleet rental company stores around 45 000 spare car keys and associated paperwork for all its vehicles in a central location at any given point in time. A total of approximately 105 000 items (folders/keys) had to be RFID tagged and enabled. Each folder contains a spare key and ENATIS paper work. The problem encountered with the old process is that the fleet rental company could never be 100% certain if all paper and spare keys (PSK) were present, even though PSKs do not move in/out of the storage area regularly. The requirement was for an integrated system where the RFID system would interface with the fleet rental company's PSK Management Software. 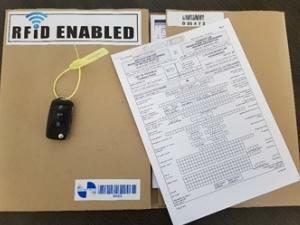 The RFID system would be utilised to do regular stock takes and carry out a basic inventory of the folders and spare keys. The RFID system would also monitor PSK movements in and out of the storage area. This would cross-reference the check-in and check-out of spare keys and documentation to what is actually in storage. As keys are metal and contain electronics and batteries that could adversely affect optimal read rates and ranges, vigorous testing was performed by Synertech in order to select the appropriate RFID hardware, RFID tags and labels. Overall operational efficiency has increased exponentially and the RFID system has proven to streamline search and retain processes for both keys and associated documents, enabling increased staff satisfaction and better customer services.